Have you wondered what you could do to make your RV listing stand out among all the rest? The answer is in RV manufacturer brochures and websites, as well as any catalogs you may come across. The best product photography uses props to create a mood that sells and highlights the product photographed. Think of your RV as your product and stage your RV when you take your listing pictures. To help you think like the pros, read on for a list of seven must-have props to stage your RV. Then list your RV here on Outdoorsy. Linen napkins are an inexpensive prop you can use to stage your RV. If you look closely at any RV manufacturer brochure, you will see that they are often used on the dinette table. Depending on the size of your dinette, you can fold the napkin and lay it on plates that are across from one another. Or you can fold it length-wise and use it as a table runner. Look to Pinterest, your favorite RV manufacturer’s brochures, or any home store catalog for inspiration. Most often, you’ll find that a few elements are mixed together to create a “dining scene” or a set table. 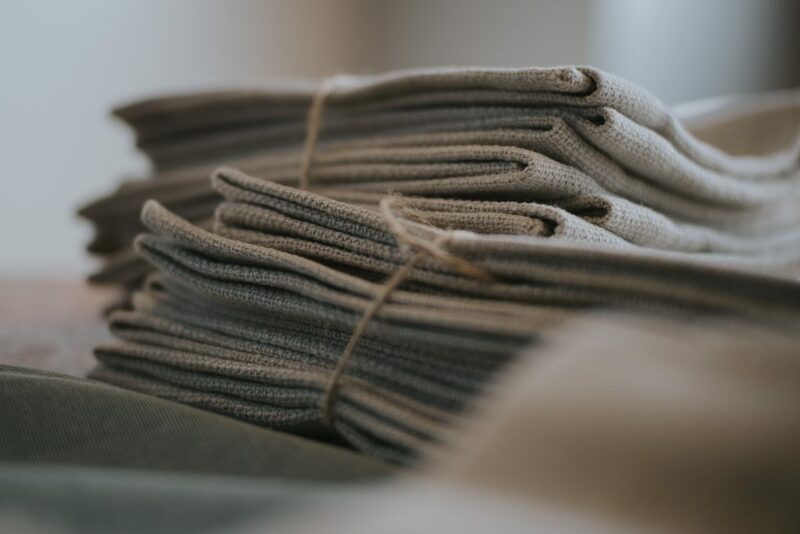 Photo by Joyce Romero on Unsplash | Linen napkins are an inexpensive and easy to stage your RV. Glassware is another inexpensive and easy-to-use prop for staging. Stage your RV on photo day by adding glassware to your dinette scene. Regular coffee mugs or aluminum “camping” mugs work great. Another option is to go with some stemware or stemless wine glasses. Complete the look by pouring in some grape juice, if you happen to have some! Food items make fantastic props for staging. You can lay a baked good on one of your linen napkins on your dinette table or RV kitchen counter. An inexpensive and easy-to-use food prop is popcorn. Pour some popcorn in a bowl and place it where a person would most likely sit to watch TV in your RV. Another way to stage using food could be to pour some marshmallows in a bowl or mug and place on a counter or side table. Or have a s’mores kit out. The possibilities really are endless. Your best bet will likely be to use food that is a treat or evokes a camping feel. Boost up the cozy factor in your pictures by staging your RV with blankets. A blanket is an easy add to the collection of props you will use on the day you photograph your RV. Try folding your blanket and laying it on the back of your RV couch. You could also fold it and lay it just above the foot of the bed. If you have a van, you may want to lay it across the bed or swivel the cab seats around and lay it on one of the cab chairs. Again, if you need some inspiration, just pretend you are RV shopping and gather inspiration form RV manufacturer websites and brochures. Plants are often used as props in catalogs and in product shots. When staging your RV, you may want to consider some small indoor plants. Tiny potted succulents or cacti would work very well on small RV shelves or on small RV kitchen counters. 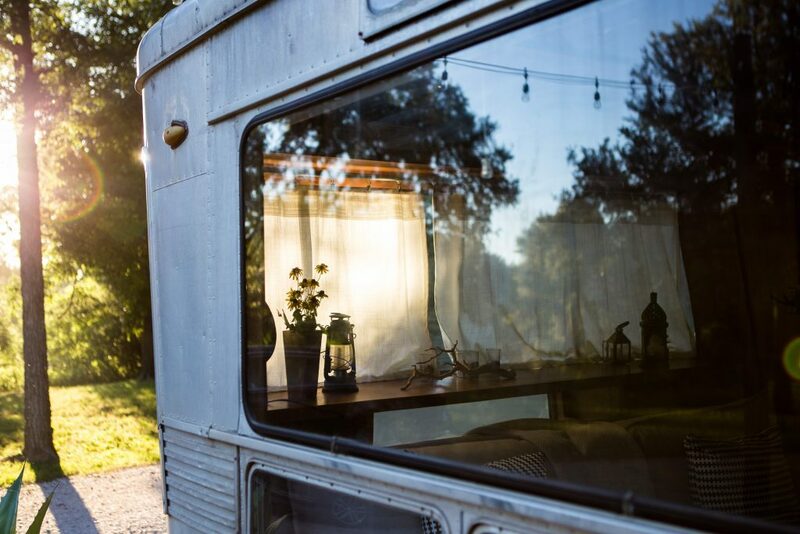 The plants will add a little bit of life and character to your RV in the listing photos. RVing is often about nature, so why not bring a little nature into your RV listing photos with some plant props? 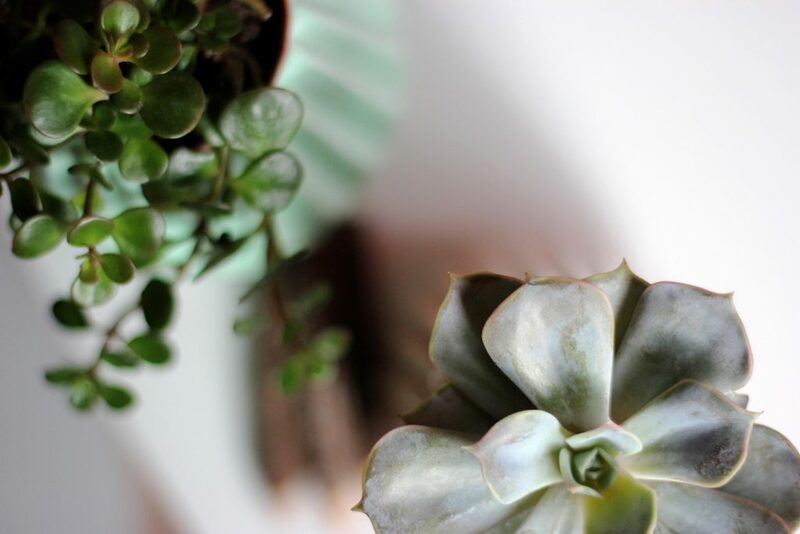 Photo by Micheile Henderson on Unsplash | Bring a little bit of nature into your RV with small, potted indoor plants. Books, and even magazines, are props you likely already have lying around that you can use to stage your RV. Stack a neat pile of books on a shelf or on a counter. If you use a baked good and a coffee mug to stage your dinette, finish it off with an open book or magazine. You can also lay a book or magazine on top of the blanket you are using to stage the bed or seating area. Last, don’t forget the outside of your RV. Roll out your awning and place two camp chairs underneath. Bring out some of the props you used to stage your RV on the inside. Try draping a blanket on one of the camp chairs and placing a book on top. 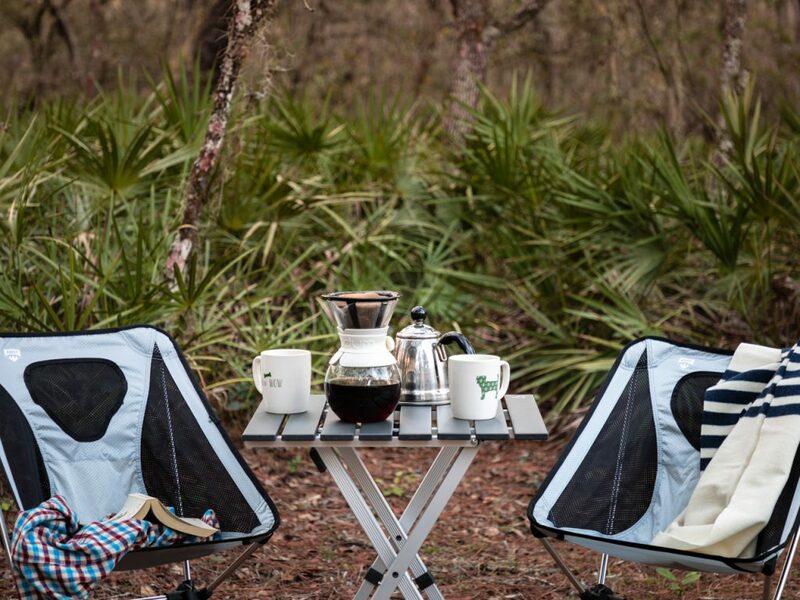 Or, try placing a small camping table between the chairs and place wine glasses or mugs on it. You’re well on your way to staging your RV like a pro and making your RV listing stand out. And if you want to do something extra-special to stand out, also consider making a special package for an upcoming holiday. 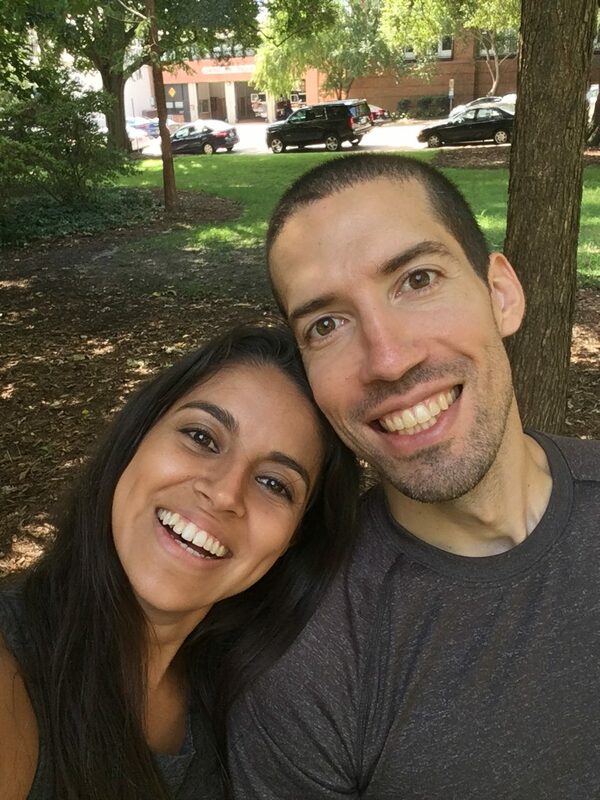 Check out the listings of other Outdoorsy owners here.